What is a WEDGNEXTiX ? According to to two youngest boys, they are awesome building toys. 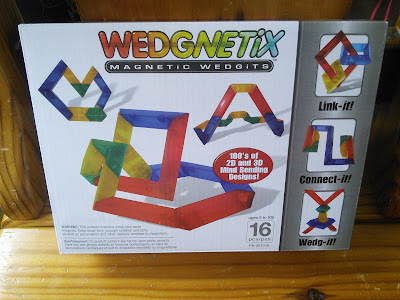 A WEDGNEXTiX is part of the WEDDGiTs building set collection. 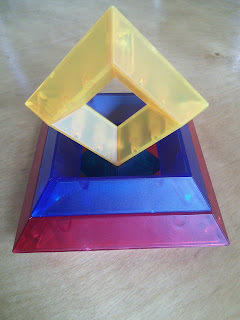 These colorful pieces have magnets in them so you can build multi-dimensional structures in both 2D and 3D geometries. You can also rotate the pieces a full 360 degrees off its mating part. 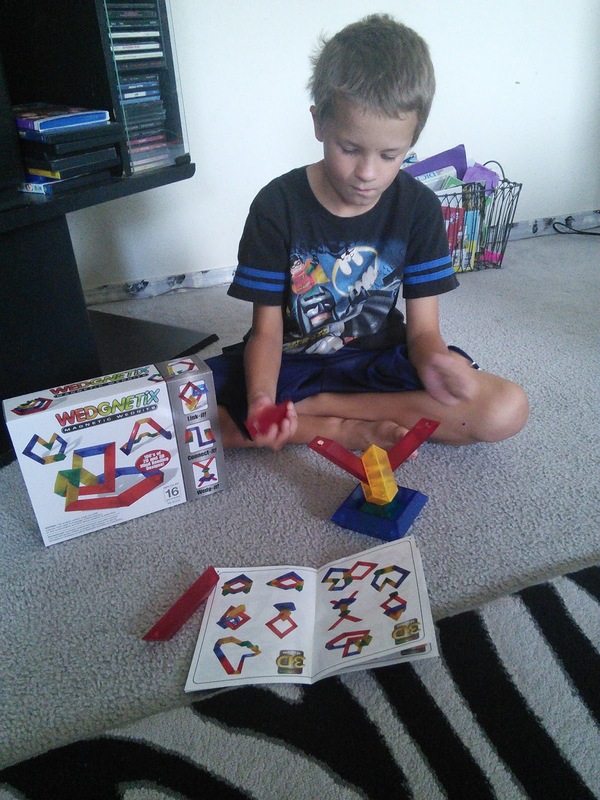 I love that my boys are learning how to differentiate from 45 degrees to 120 degrees through a fun hands on toy. It is amazing that just 16 pieces can make 100's of mind bending designs. The WEDGNETiX comes with a colorful booklet that has samples of the numerous designs that you can create with the building blocks. These blocks can be stacked, nested, linked and wedged together to create many designs. The booklet even shows how to make basic shapes like squares, triangles and hexagons. These building blocks are made to last and will provide hours of fun. My boys were so excited to build different things and had a hard time taking turns as they wanted to keep making a different design. The best part is the magnets are enclosed in the plastic so there is no chance of a younger child swallowing a magnet. 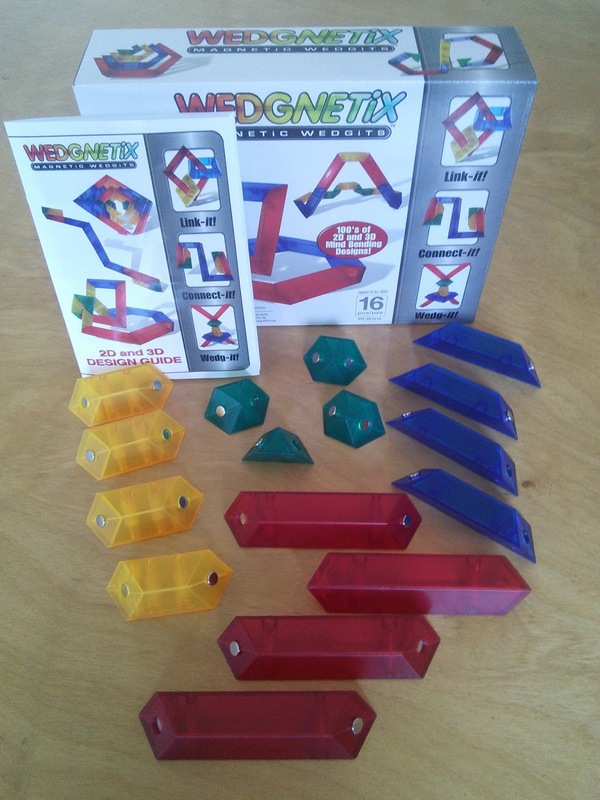 The teacher in me thinks WEDGNETiX would be great in classrooms as these blocks encourages imagination, creativity and group participation.I just love toys that help my children learn through fun. The WEDGNETiX construction bars come in four different lengths allowing kids to connect and rotate parts into perfect symmetries and outrageous spatial designs. The recommended age for the set is 5 years + and, unlike other building sets, these are safe to use around younger children. My boys are 7 and 8 years and this set was perfect for them but I can see older children enjoy this set as I enjoyed making designs too. 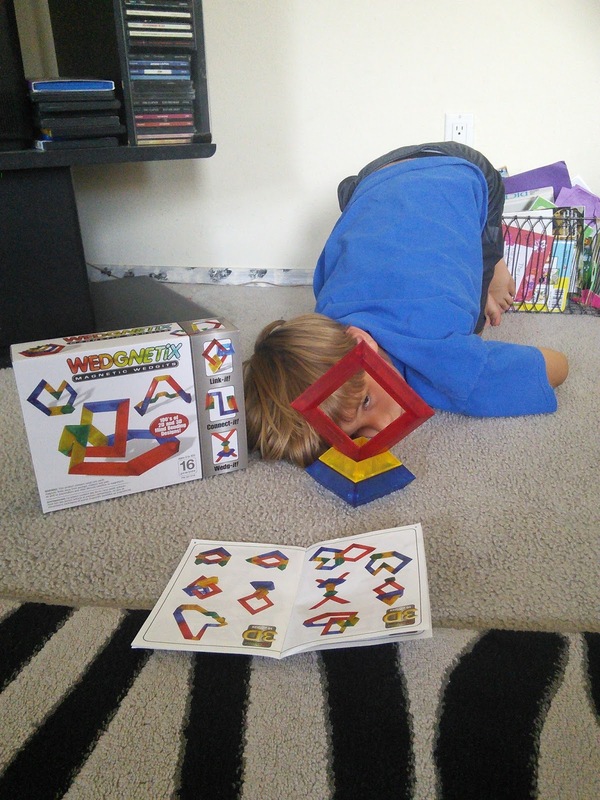 The building set is great for teaching children about geometry. Here is what is included inside the box. For more information about WEDGNETiX Magnetic Building Blocks, click on the below link. You can purchase this set at Target. Click on this link to see a video of the toy. "These opinions are my own and I was received the above mentioned product in exchange for a review." My son would have loved this. It sure looks like fun! What a neat set. My boys would have a blast with this. These look so cool. My son would love them. Thanks for sharing. The WEDGNETiX construction bars are a really great toy. This looks like so much fun! I played with something similar before and it was a blast. Something educational and fun, love it! I like toys that make my kids think. My kids would love this. What a nice toy! I love toys that help kids develop their imagination or stretch it a bit more. LOVE this!! I am going to Target this weekend and find these. This would be great for homeschooling and just for having fun. Thanks for sharing!!!! I want these. Not for my kids. For me. These are awesome and no one touches mom's toys! HAH! The magnetic feature gives it extra props, as it makes the widgets more kid friendly... I know a bunch of kids who would love to have it. Love to buy something like this for my son. Love it! Looks like a great idea for Christmas presents. I like that it is safe for younger kids, too. My kids would want to play with this! These are for adults right? Maybe I'll get them now since my boys aren't even a year old yet and I'll "break them in". lol! Wow these look so fun for little kids! This toy looks like fun! thanks for sharing.